J.J. Paige had a career day on Saturday. Photo courtesy of MU Athletics. Millersville dropped to 0-6 on Saturday to Bloomsburg at Chryst Field at Biemesderfer Stadium. The Huskies defeated the Marauders by a score of 41-20. Despite the loss, Millersville head coach Greg Breitbach stated that the offensive production improved. The skill players were able to make plays in an open field. There was better play from the offensive line and the quarterback positions. The offensive line’s performance was the best it has been all season according to Breitbach. Breitbach then went on to say that there were chances that they could’ve made the game a lot closer in the first half. He also mentioned that the team needs to play four quarters and, get themselves into a fourth-quarter ballgame with a legitimate chance to win. 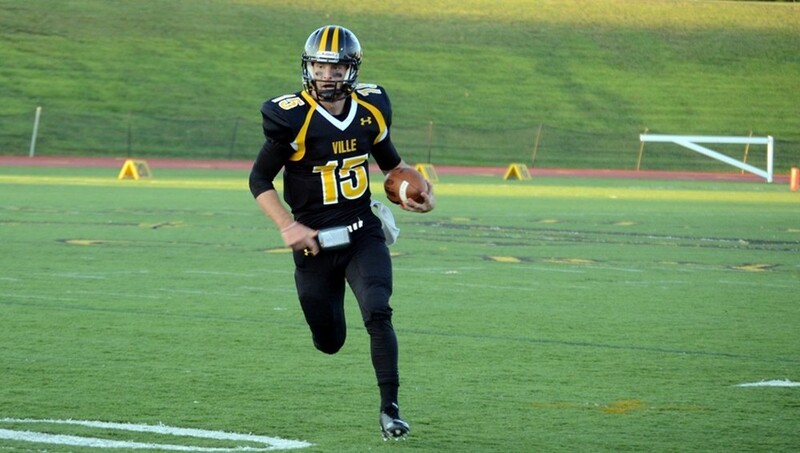 Millersville quarterback JJ Paige finished with 250 passing yards, his all-time career high. His passing performance was the first time a Marauder quarterback threw for 200+ passing yards since Connor Casey’s total of 313 against Bloomsburg in 2012. Breitbach stated that Paige was in more control and accurate along with taking a lot of steps forward in his progression. J.J. Paige had a career day on Saturday. Photo courtesy of MU Athletics. “I think a lot of that is belief in yourself and in your teammates,” Breitbach commented on JJ Paige and the offense. The Huskies scored on their first drive of the game. Lawrence Elliott Jr. capped a 10 play, 61 yard drive with his 1 yard touchdown run to the end zone. Later in the first quarter, Elliott ran for 69 yards which would lead to Bloomsburg’s second touchdown. Bloomsburg’s second touchdown was scored in the beginning of the second quarter by Joe Parsnik. Tyler Smith made a 25 yard field goal for the Huskies to extend their lead to 17-0. Millersville responded with a solid kickoff return from freshman Phil Overton. Breitbach stated that his trust in Overton’s ability to field the ball made him and his coaching staff decide to have him return kicks for the Marauders. Overton finished with 203 return yards. Paige was throwing spot on passes to CJ Bostic, Kevin Wiggins and, Cimirrow Moat during that drive. Paige’s 18 yard pass to Bostic got the Marauder offense into Bloomsburg territory. His 13 yard pass to Moat got them inside the red zone. A few plays later, the Marauders scored when Paige threw a 3 yard pass to tight end Tyler Zilen. “You expect players to make plays and those guys have taken a fair amount of reps this year,” Breitbach stated. The Huskies however extended their lead to 24-7 on the next drive. On the third play the drive, Millersville cornerback Alpha Khan nearly picked off Bloomsburg quarterback Tim Kelly deep in Marauder territory. The ball fell out of his hands as he covered the intended receiver, Connor Gades. The costly play on defense would result in Parsnik’s second rushing touchdown of the game. Millersville began the second half with play-calling that brought excitement to the crowd. The Marauder offense executed a flea flicker that resulted in a 42 yard reception made by Kevin Wiggins. However, they were unable to capitalize on that opportunity. Kicker Evan Stahl was short by a few feet on a 51 yard field goal attempt. “We’ve use that play in the past and we felt that was right time to use it,” Breitbach commented on the flea flicker. On Bloomsburg’s next possession, Tim Kelly’s 25 yard pass to chat Hoffman got the Huskies in field goal range. Tyler Smith made a 47 yard field goal to end an eight play, 37 yard drive that began on their own 34 yard line. Bloomsburg’s next drive began with hard-nose running from Joe Parsnik. Parsnik ran for 22 yards on the first three plays on that drive. Two exorbitant penalties committed by Millersville allowed Bloomsburg to score another touchdown. Tim Kelly then capitalized for the Huskies to extend their lead to 34-7. Millersville managed to score on their first drive in the fourth quarter. A holding penalty on Bloomsburg and Paige’s 18 yard pass to Bostic got the Marauders deep into Husky territory. Paige then ran 12 yards to get to the Bloomsburg 7 yard line. A 2 yard pass to Cimirrow Moat then led to a successful quarterback sneak at the goal line. Stahl’s extra point kick was no good which became his second missed field goal attempt. Bloomsburg fired back quickly with a 20 yard run from Derek Burkhard. His 20 yard run would allow Joe Parsnik to score his third touchdown of the day. On the ensuing Millersville possession, a facemask penalty on Bloomsburg got the Marauders deep into Husky territory once again. JJ Paige then threw a 14 yard touchdown pass to the corner of the end zone with Sean Quarterman making the reception. Defensively, Rasheed Johnson, who entered the weekend as the number two tackler in the PSAC finished the game with 18 tackles. He was one short of his career record. The Marauders will travel to East Stroudsburg University to face the Warriors next Saturday, October 17 at 2:05 PM. The Marauders will be facing another athletic quarterback who has great mobility. Breitbach emphasized defense in regards to stopping the run and in the secondary.